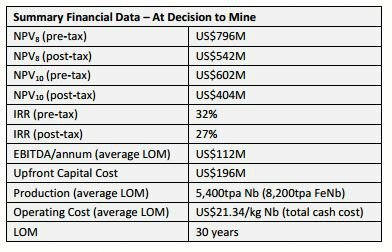 Cradle Resources (ASX:CXX) thinks its Panda Hill project will make $US122 million ($A156.4 million) a year before taxes for a total of 30 years. It has the results of a definitive feasibility study on its Panda Hill niobium project back, and it’s told its investors that the project will have an annual EBITDA figure of $122 million, based on a project with an upfront capital cost of $196 million and production of 5400 tonnes of niobium per year. 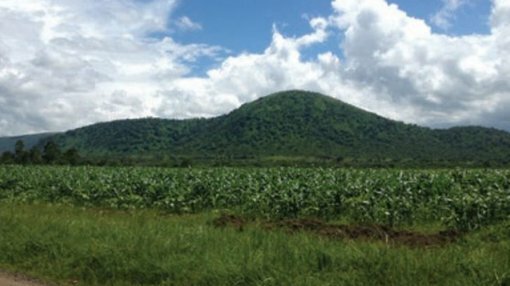 The DFS is the latest step in the process of getting the Panda Hill project up and running, with CXX having previously focused on the ability to produce a saleable product from its ferrous niobium ore. Still to go in the process are securing an offtake agreement and financing for the project – which is why no particular start date on the project has been offered as yet. CXX has envisioned the project being a stepped process, whereby the first four years of plant throughput of 1.3 million tonnes per annum, and then scales up to 2.6Mtpa after the first for years of operation. The scaling up process will be funded by the production in the first for years of production. The post-tax net present value on the project has been pencilled in at $542 million for the first stage, with that to increase to $1.02 billion in the second phase. It also pegged the post-tax internal rate of return at 27%. For the economics of the project, CXX assumed a $37.56/kg niobium price – which is an amalgam of two desk prices. CXX told investors that the first stage of the project would chew up 6% of niobium production, but with demand forecast to increase by 3-4% per year it would not be taking a huge chunk of the market growth. Its chairman Craig Burton told investors that the company didn’t need to say too much about the project now the DFS was out. “This will be the first new niobium producer in 40 years and the only new producer of this rare metal in the foreseeable future.